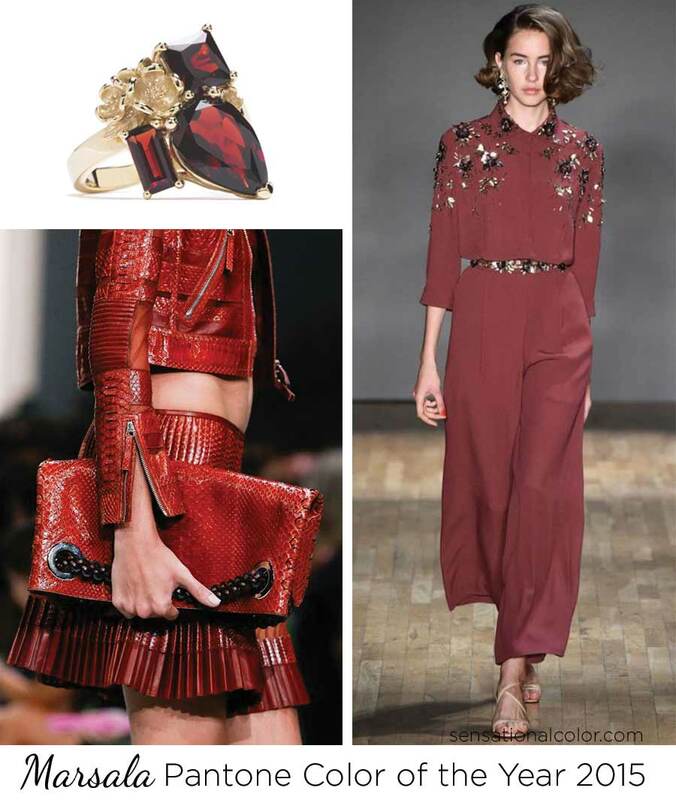 …Marsala is Pantone’s pick for color of the year 2015. Released to the media today, this color made its debut via the Wall Street Journal. Pantone describes the color as “a naturally robust and earthy wine red.” Leatrice Eiseman, executive director of the Pantone Color Institute, said the color would enrich the mind, body and soul. In order to arrive at its color of the year, Pantone said it seeks color influences around the world, including in the fashion and entertainment industries. 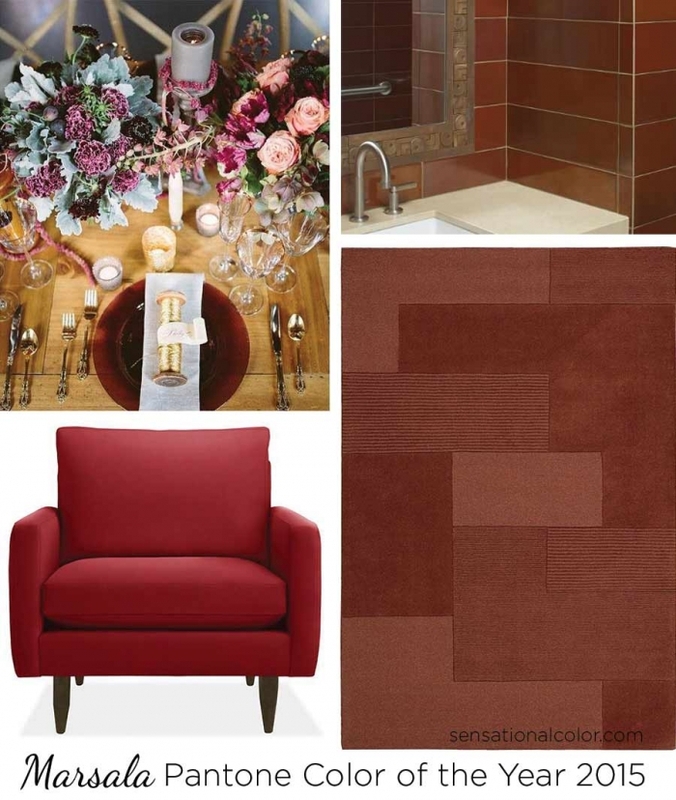 See the sources for all images pictured above plus more examples of Marsala on my Color of the Year 2015 Pinterest board. So color mavens what do you think about their choice? I love this color – rich and beautiful and warm. I sincerely disliked Emerald (2013) and wasn’t wild about Radiant Orchid (2014). I this Marsala will be able to be used in a variety of industries easily; fashion, furniture, interior design etc. I wasn’t a big fan of either of the past two picks. This color has more promise. I love the warm, earthy feel of this color, yet rich and sophisticated too! It happens to be my favorite shade for lips and nails. 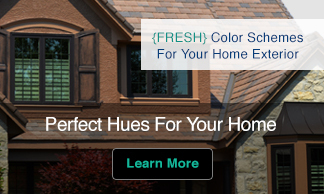 This hue will play a great role in accessorizing, whether fashion or interior. I think it will also be fabulous as a textured, brocade type linen. Good points, Nancy. I think the finish and texture will be important to this color having longevity. I love the beauty and depth of this rich color. It will be widely embraced here in the mid-west which means we’ll be trend-setters rather than trend-followers for a change. Thanks for sharing it so quickly! You’re very welcome, Jan. I agree — always more fun to be a trend setter rather than followers. I like it so much better than the previous colors, especially Radiant Orchid. A color that we can actually use and be inspired by for interiors. Works well with ethnic influences as well. You are right Nancy. This color works with ethnic influences very well. What would be the Benjamin Moore color? I haven’t pulled out the decks to make a match but it put me in mind of their Maple Leaf Red 2084-20 or Hot Apple Spice 2005-20. Just yesterday, I read on a decorating blog that the choice would likely be “Guilford Green” or “Paradise Blue”. I didn’t like either one, but this, this is gorgeous! Love the richness and tonal color – interested to see how this translates into spring and summer living. I like the deep, rich versions of this color and I’m looking forward to see how this shows up in all kinds of design. Thanks for the comment. It made me smile. Nice warm colour wine red is. Gives life to walls when used and the flexibility to make fabulous combinations with other colours. 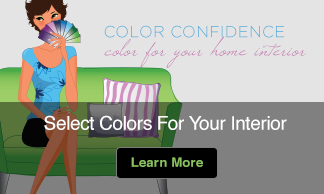 I can’t wait to see the creative combinations as more designers begin to use this color. Lovely color but I have to wonder if it signals a shift from the last decade of white and gray tones? Will we start to see more warm tones, richer browns? Will the gray and white kitchens we just installed suddenly date our houses (Oh, that white kitchen with gray marble counters is from pre-2015). Marsala would be pretty next to the “new” brass making a comeback. We are seeing colors go warmer but gray is not gone. Brown and gray are going to live/work side-by-side…at least for the near future. Marsala will really look great with all the grays that have been growing in popularity across the country. Many homeowners already have some marsala in their existing “traditional” decor. Pairing with gray makes for a great segue into a fresh contemporary direction for homeowners without feeling as though they must throw everything out and start over to be more on trend. Hooray, a cost savings! Good points, Susan. Thanks for sharing. Yes, many companies have colors similar to Marsala available right now.